Dr. Reagan and I, on our ministry's television show Christ in Prophecy, had the pleasure of asking this question of Eric Barger of Take a Stand! Ministries. Eric is an authority on the cults, the New Age, and rock music today. From his past as a former drug addict and rock n' roll musician who was deeply involved in the New Age movement, Eric has emerged since he gave his life to Jesus Christ to become one of today's greatest defenders of Christianity in America. He joined us to talk about the greatest threat to the Church today — apostasy, particularly from the Emergent Church Movement. 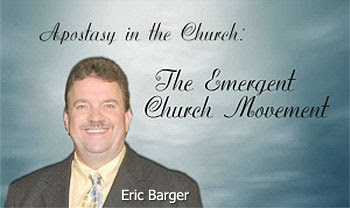 Eric Barger: The Emergent Church Movement has only been around about 15 years, yet there are millions of people who have fallen into it, and many don't even know it. I want to caution people, don't be hung up on the term "Emergent" or "Emerging Church." We need to know what we believe and why we believe it first, but we also need to be aware that there are a lot of things being called Christian or being called acceptable inside Christianity around us. The Emergent Church Movement is really based on the idea that we need to present the Gospel in a different way, or present Christianity in a different way to the world because we live in a post-modern society that can't accept what truth is. We also wouldn't want to talk too much about things that divide us. We just want to have an expression of Christianity that feels good to us. When I say Post-Modernism, it's the idea that truth is kind of a moving target. Some may be familiar with the term Epistemology which is kind of where we come to a place of figuring out what knowledge and truth are. But, in the Emergent Church Movement, it's all about Relativism. You make up your own rules as you go along. As I've examined the Emergent Church leaders, the single thing that I have seen over and over is that they use Christian terms that we can relate to, just like many of the cults do, but they have attached radically different meanings to those terms. Dr. Reagan: It seems to me what we are really talking about here is the fact that society went through a period of time when people thought that the answer to all of man's problems was science. Science was going to solve everything. Well, science didn't. In fact, science has made it worse with atomic bombs and so forth. And so, we are in a sort of rebellion where people are claiming, "You know, science really isn't it. We've got to move to a more mystical way of thinking that's non-scientific and based on feelings." But, quickly the discussions started turning to the idea that maybe we don't need to hold all the doctrines of the Church. Maybe some of those doctrines such as the doctrine of the Trinity or the doctrine of the Deity of Christ or certainly the doctrine of Hell can be done away with. Removing uncomfortable doctrines will draw those people back, they thought. So, it's not just about a new way to present the Gospel, rather it's about a complete change of what people think the Gospel is. Nathan Jones: It is experiential in that truth is what you experience. You filter reality on how you yourself see things. So, if the Bible says that Jesus is the Son of God, well I didn't experience Him in my life like that, so He must be an angel or something else entirely. That is how they come up with their truth. The Bible isn't the absolute standard that is used in the Post-Modern generation. Dr. Reagan: So, it is really a rejection of the concept of absolute truth. It's more feelings. Your truth is your truth, and my truth is my truth. Actually applied, if you are going to discuss something like homosexuality you wouldn't go to the Bible and ask, "What does God say about it?" You would instead ask, "What do you feel about it?" Nathan Jones: Yes, it is the ultimate ego trip because you have become God. It is you who decide what is right and what is wrong. You can also live in a reality that totally conflicts with how the world works, and that's fine with you. Everyone is just supposed to get along and tolerate each other's ego trips. Eric Barger: What you are saying right there also defines the New Age Movement. If you're a New Ager, it's all about you making up your own rules about what you think is right. The real problem with the Emergent Church Movement is there's a general lack of respect for the authority of the Bible. That's the key problem. The Emergent Church would not be an issue if the Church was willing to have its Bible open and test everything that comes along, including what we say against the Word of God, to see if it matches up. Eric Barger: Yes, Bell said the Bible sounds good, but it's simply not true. See the way that he ended his statement? When I wrote my first book back in 1987, I wrote it on paper with a typewriter, if you can imagine that in our computer world today. I remember the editor of my book came in after working with her for several weeks and she threw the manuscript down on the kitchen table and she looked at me and asked, "Do you really believe everything in this manuscript?" I answered, "Yes." I had never seen the look that was on her face. She asked again, "Are you sure?" I replied, "Yes." She warned, "Good, because once it's in print you will have to defend it." When somebody writes in their book that the Bible isn't all that we need, they are taking their stand, unless later they do a great retraction with repentance. Of course, Rob Bell would say that repentance isn't about Christianity and that if somebody is teaching about repentance then they couldn't be talking about Christianity.